Belstaff presents the Autumn Winter 18 collection, ‘Made In UK’, celebrating the brand’s British roots, with nearly a hundred year history of innovation and legacy of protection for adventure. Belstaff originated as a manufacturing company in Stoke on Trent and this season gives the opportunity to celebrate this with the return to production in the UK of the Roadmaster and Trialmaster. The 70th Anniversary ‘Made In UK’ outerwear series launches a new tumbled coated cotton with graphite effect. Digging into Belstaff British history also led Delphine Ninous to the revisit the dispatch rider coat. Originally created in the 1930s and used by the dispatch riders in WWII, this coat is an important iconic outerwear piece that has become a symbol of elegance and protection through time. 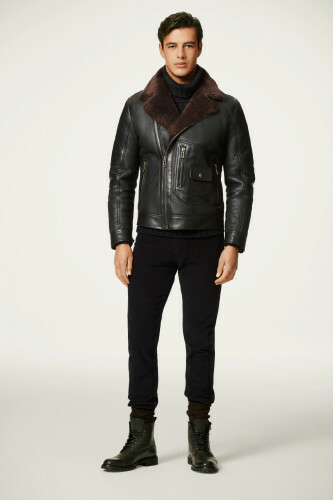 Throughout the decades it has been produced in bonded cotton, rubberised cloth with ultrasonic welded seams and this season it has been revisited in a vegetable leather and shearling with a soft shoulder construction. Worn with high knee laced up combat boots this is a key silhouette of the season. Belstaff’s heritage silhouettes have all been updated for AW18 in a palette of deep hues including earthy greens, muddy blues, deep mauve and sand. New silhouettes added to this fabrication include an oversized parka, inspired by the military parkas worn by the mods, and a classic field jacket. As part of the ‘Made in UK’ programme the iconic Roadmaster has been updated with a red check lining that directly references that used in British subculture clothing and vintage nickel hardware, to add a modern femininity. Belstaff continues to evolve both the parka and field jacket silhouette through many different iterations, creating an extremely versatile outerwear offer across menswear and womenswear. Both long and short styles come with fur or shearling-trimmed hoods all providing both protection and warmth. Bold red and moss green heavy down filled versions offer excellent functionality, whilst a more fashion-focused parka style features a graphic matt black bonded stripe and removable quilted silver lining. Belstaff’s iconic Rider Coat has been reworked in new materials ranging from cotton nylon with contrast sleeve lining and a printed desert camouflage to a softer more feminine interpretation in wool cashmere. This silhouette is pushed further in a supple and luxurious vegetable tanned leather and in reversible shearling with a light wax treatment. Other coats include a classic Crombie style for women with pop coloured under collar and a wool melton version a plus pea coat, with detachable nylon MA1 bomber internal and fur trimmed hood. This season’s leather offering includes new shapes and exciting treatments. In our signature hand waxed leather, a luxurious and feminine field jacket with fur collar and classic Belstaff trim takes inspiration from the Archive. The Trialmaster has been re-worked for women in soft oily suede and a more modern interpretation in bonded and raw cut vegetable tanned leather. White paint effect over black napa and hair calf, studs and velvet have been collaged together over a classic perfecto shape, a technique that has been applied also to shoes and denim. Recognisable sportswear silhouettes have been re-interpreted in soft napa with suede stripes, whilst classic leather silhouettes have been re-produced in cotton velvet in bright red and black. Knitwear pieces took reference from punk and youth culture using mohair, virgin wool and chunky cables. Jersey has been inspired by the graphics of band souvenirs t-shirts of the era. Military inspired styles dominate the collection with a new, knee high combat lace up boot in matt black leather and patent. Leopard print hair calf has been used on a shorter more feminine boots with buckles and seasonal materials have been collaged to update the classic Dagenham sneaker. A flash bolt detail in elastication features on a Chelsea boot and this motif is used again to update the classic high-top style.